Introduction Jejunal adenomas (JA) are exceedingly rare lesions with potential for malignant transformation and resultant poor prognosis. Management is usually surgical. Double balloon enteroscopy (DBE) allows minimally invasive diagnosis and curative management. 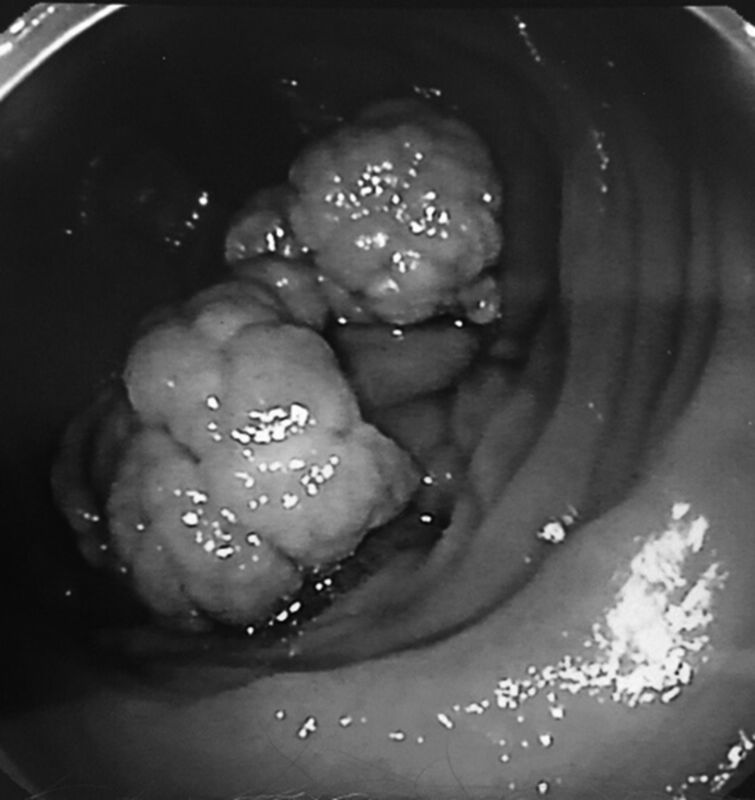 This case highlights the usefulness of DBE facilitated widefield endoscopic mucosal resection (EMR) of a large sessile JA presenting with intermittent subacute small bowel obstruction caused by intussusception. Method A 46 year old woman with a 4 year history of intermittent cramping abdominal pain underwent a CT enterography demonstrating a 10 cm jejunal intussusception (15 cm distal to the ligament of Treitz) with a suspicious leadpoint at the intussusceptum (Figures1,2).At diagnostic anterograde DBE (under conscious sedation), a large (6 cm) sessile jejunal polyp was identified as the culprit lesion (Figure 3)&cacute; it’s location was marked by a submucosal tattoo of sterile India ink and histopathology of biopsies confirmed this to be a JA with low grade dysplasia (LGD). Results At a second preplanned therapeutic anterograde DBE, performed under general anaesthesia, the intussusception was reduced using the doubleballoon technique and the JA was successfully resected by widefield EMR without complications (Figures 4,5). Histopathology of the resected JA only showed LGD and confirmed complete resection. A 3rd followup anterograde DBE performed two months later did not reveal any evidence of recurrence. Conclusion Our report describes the definitive role of DBE as a minimally invasive approach for the diagnosis, curative management and follow up of a very rare and premalignant cause of jejunal intussusception.